“I am a huge fan of the tiny Sony NEX5n camera” says Sam Morgan Moore. The little camera is incredibly useful for getting interesting angles in a real hurry, making the production day stay on schedule while adding those little touches that make a shoot a little special. I think clients are scared of the tiny form factor, assuming, wrongly, that the image quality will be poor, but the camera is certainly a serious tool worthy of consideration. Unlike a GoPro the camera has a large S35 cinema size sensor and works well with proper lenses. The large sensor is great in low light and the depth of field matches our larger cameras. Another advantage over a GoPro is that is is fully manually controllable, and ND filtration can be added in bright light – this avoids the stuttering images you might see from a GoPro. The little camera is a load sharper than the Canon5dmk2 too – we have tested that out. 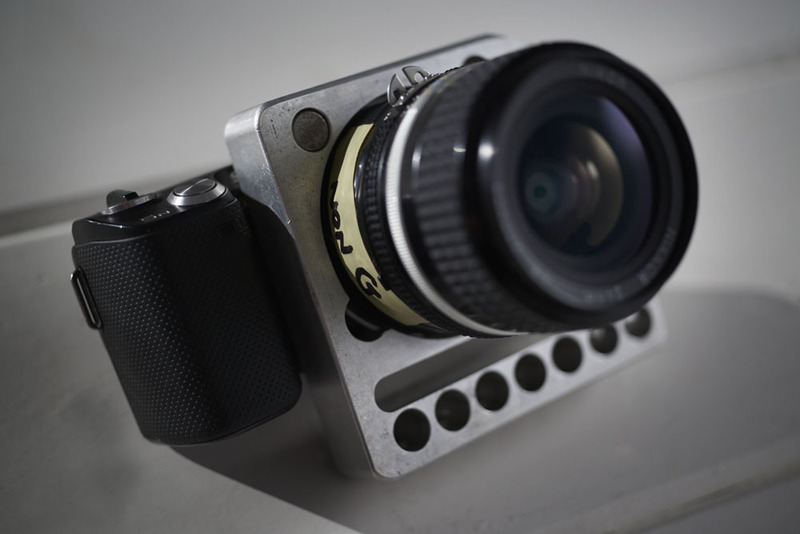 At FrameDogs we have a unique ‘hard mount’ for the little camera that means it is ready to mount in seconds, the cage is custom made,one of one on the planet! So dont be scared of this little power house of a camera, add some funk to your shot-list without eating into your schedule! Our little camera in one off hard body for ultra rigid mounting and sporting proper glass..
Sony NEX5n with ultra hard mount cage.